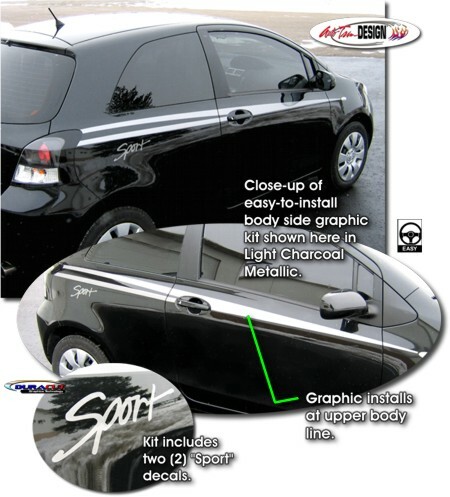 Set your '07-Current Toyota Yaris two (2) door Liftback apart from the rest with this unique Body Side Graphic Kit. This easy-to-install kit is packaged with graphic sets for both sides. They're PRECUT and ready to install in a wide variety of colors. Slight trimming is required at door jambs. Graphic kit is vehicle specific and is designed to fit '07-Current Toyota Yaris two (2) door Liftbacks and will not fit other vehicle applications. Kit includes decorative "Sport" decals at no extra charge.